There is a very dear place in my heart for this family. "Life" tends to keep us both busy, but these two as a couple, they are my spirit animals. I adore their authenticity and the genuine friendship that has grown through the births of two of their kiddos. I almost missed out on this friendship over 3 years ago, when I didn't think I was going to be able to shoot her birth, myself only being 4 weeks postpartum with Alden. Goodness, how thankful I am that I was there that day and the friendship that followed. Kelly is a boss when she labors, she doesn't mess around. Her body goes into autopilot and babies tend to be born breaking the speed barrier. I credit that to her good genes and hypnobabies, and a stellar husband support system. I know she and Nolan would beg to differ, and it might not be PC to say this, but I had so much fun at both of their births. Truly. Yes we laughed, but I loved watching them. How well they work together to bring their babies earth-side. While I do love watching the miracle of life, I never tire of watching couples in love. One of the perks of my job is continually witnessing love in it's purest forms. And these two, they've got it. Oliver, the oldest stole the show at Evie's birth which can be seen HERE. This time it was Evie's turn the steal the show from Mac, and she did like only a middle child can. I love you sweet Pendletons! Thank you for asking me along for the fun! 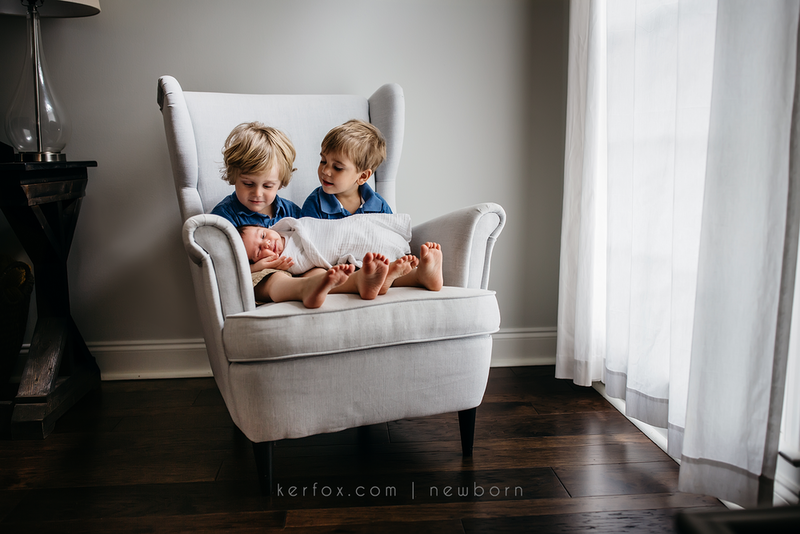 Columbus, GA Photographer | Birth | Ker-Fox Photography | Merritt M.
The closest I've EVER come to missing a birth, was this one right here. Rachel was a scheduled c-section but sweet Merritt had decided she was to choose her own birthday. I got the call that Sunday just before lunch. Admittedly in my pajamas, no make up and doing laundry at home about 25 minutes from the hospital, when my phone rang and I heard Rachel's mom on the other end: Rachel's in labor, they're about to take her back, you're probably not going to make it. I've never run through the house, put close on and grabbed my camera bag so quickly in my life. By the grace of God I was on-call for her with my bags packed and ready, and my husband was home to watch the kids or I would've missed it for sure. (Insert sage wisdom of a seasoned birth photographer right here ---> this is why we charge the same thing for c-section births as labor clients, there are no guarantees that babies come on certain days). I arrived at the hospital just knowing I wasn't going to make it, but the wonderful staff at St. Francis, my family/home away from home, had a nurse at the entrance of the waiting room ready with a set of scrubs for me. They rushed me back, I threw the scrubs on, unpacked my camera, and I kid you not as I put it around my neck they called Justin and I back into the OR. From the time I arrived to baby being born was less than 10 minutes. Rachel was grace under pressure the whole day... there were concerns in the hours leading up to the delivery, then sweet Merritt required a brief visit to the nursery for some extra help right after birth, and then Rachel experienced a rough patch as well when her epidural wore off precipitously. Her doctor, Dr. Stephens was phenomenal. He is always a calm voice, and a confident comforter. The whole day felt like a whirlwind for me, I can only imagine what it must've felt like for her and Justin. When the buzz of busy finally settled down, their precious twin boys (Their birth story can be seen HERE) came to snuggle and love their new sister. And as they tend to do, the bigs steal the show. This mom. Her husband. Their birth team. Everyone fought so hard for this precious momma. They pulled out all the stops to provide the delivery she had hoped and waited years for. Unfortunately, after all options were exhausted, and mom was rightfully exhausted.. sweet babe came into the world through her mom's tummy, and all was right in their world. Jessica and Martin, you were such an amazing team. Jessica you are fierce (that word is so overused, but in this case totally necessary). YOU ARE FIERCE. You fought like a warrior through your labor, and then you faced the unknowns of surgery like a boss. I wanted to crawl in your recovery room with you and just hug you and tell you how proud I was of you. And Martin, my friend, you were her steadfast rock. If you were nervous you never let her see. You were a constant source of encouragement. And when sweet Martha Ruth needed some skin to skin while mom was in the OR, you gave her a warm place to wait for mom. And her team... Her OB Dr. McPherson, her amazing nurses Ashley and Leslie, and of course the baby crew of Dr. Cason, Dr. Taylor and her precious baby nurse, Melissa that I caught adoring Martha during her newborn exam, and Joelle who so sweetly helped daddy do skin to skin. She had the dream team. But then again, everyone at St. Francis comprises to make a dream team!